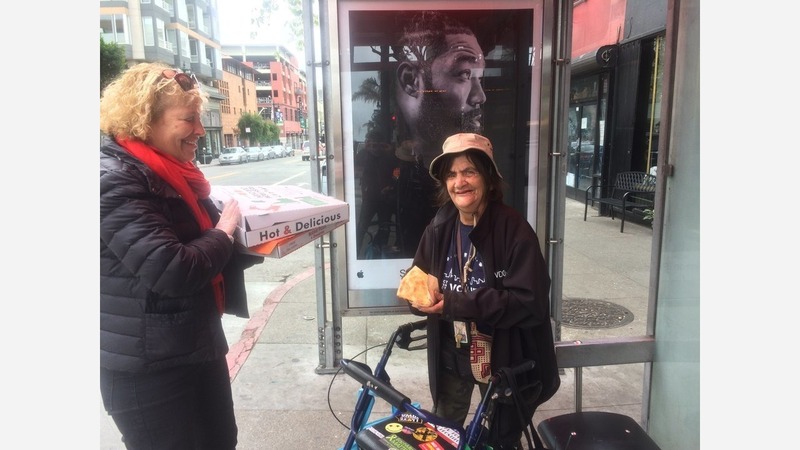 "Pizza Lady," AKA Andrea Carla Michaels, has been delivering daily free slices of pie to neighbors in need for more than two years in the Lower Polk corridor. So far, she's distributed more than 17,000 slices, and she has no plans to stop. 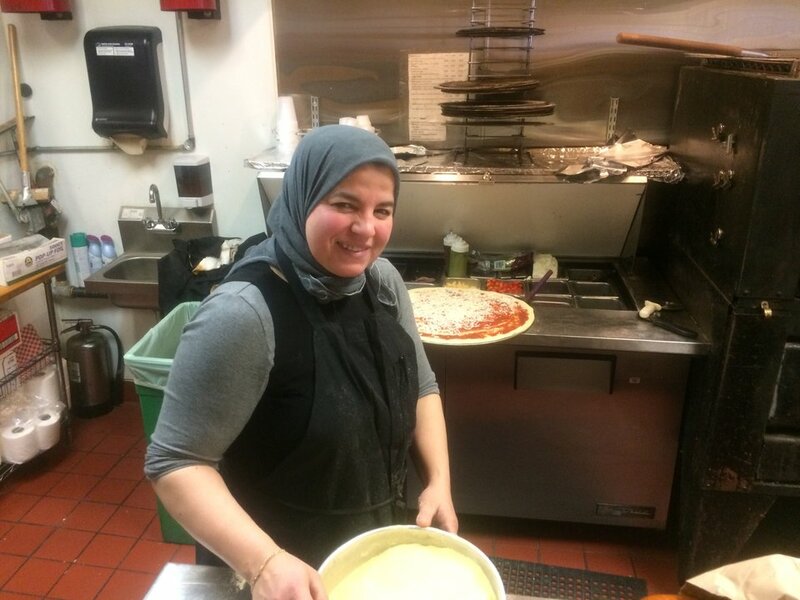 To begin each run, she visits Nob Hill Pizza & Shawarma at 1543 California St. for provisions. "Whatever is left over, we save for her," said owner Najet Sehili. City health requirements require slices to be thrown out every two hours if they aren't sold. When Michaels discovered that heaps of hot slices were being composted, she asked if she could pass out pizza to people in the neighborhood. Nob Hill Pizza & Shawarma owner owner Najet Sehili. Soon, handing out slices became part of her daily routine. "The pizzeria would eventually call me day or night" to gather pizza, she said. "Little by little, it evolved into a daily thing." On our visit, Michaels (who doesn't eat pizza) filled a pizza box with three layers of pie, a total of 16 pieces for her next run. "It averages between twenty and thirty pieces a day," she said. "Roughly one-hundred-forty pieces per week." As she prepared to head out, a woman entered the restaurant, recognized Michaels and asked for a slice with meat and cheese. To maintain her relationship with the shop's owners, Michaels only shares food outside the eatery. Out on the sidewalk, she handed the neighbor a bottle of water, a pair of new socks and a few slices of pie. After parting ways, Michaels said the woman and her husband recently lost their housing and are trying to make a go of it on the streets until they can find long-term shelter, "but I try not to get involved in everyone's story." Michaels offering pizza to a neighbor. Michaels lives a few blocks from the restaurant and usually starts her route on Polk Street headed east. By coincidence, her beat conforms to the same neighborhood boundaries as the Lower Polk Community Benefit District: California to Geary Streets, and then Larkin Street to Van Ness Avenue. Moments later, she recognized a neighbor waiting at a shelter for the 19-Polk bus and quietly offered a slice. "Some look put together, some have been unhoused for dozens of years," she said later. "You just have to be mindful." The neighbor initially declined the offer of food and accepted a few pairs of clean socks. Once she realized a reporter was present, however, she said her name was "Lance, like the bicyclist," accepted a slice and some water, and posed for a photo. Michaels said the population of unhoused neighbors in the area may be on the rise. "I see at least ten people a day that I've never seen before." 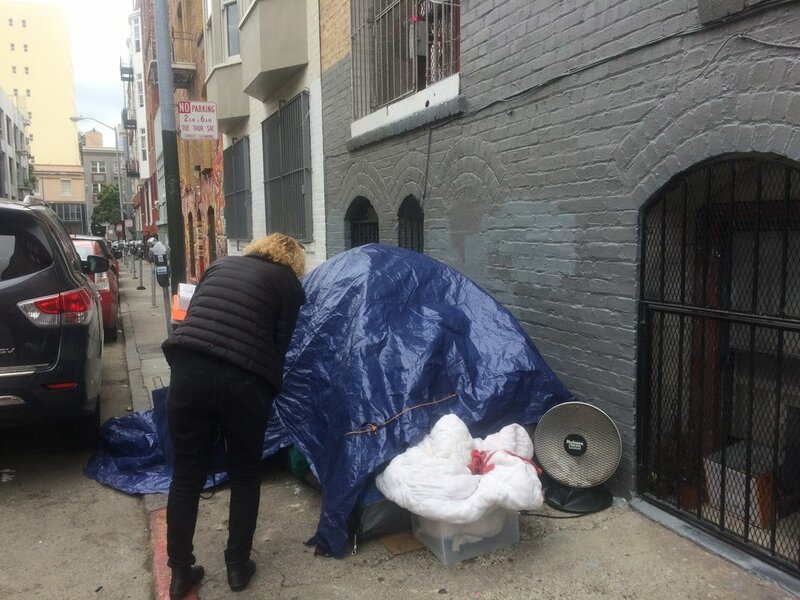 In Fern Alley, a spot with open drug use and several tent encampments, the Pizza Lady was recognized by multiple residents. Michaels said many of the alley's inhabitants "can't make it to the soup kitchens." As she chatted, several gathered around while she distributed slices and socks. A man driving a late-model imported car parked, got out, and asked for a slice after announcing that he was hungry. After asking which pizza he'd prefer, Michaels grabbed a few napkins, folded the slice and handed it to him. The driver ate quickly, got back into his car and drove off. "Chances are he's a drug dealer," she said. Regardless of who asks, Michaels said she'll feed "anyone who's hungry." 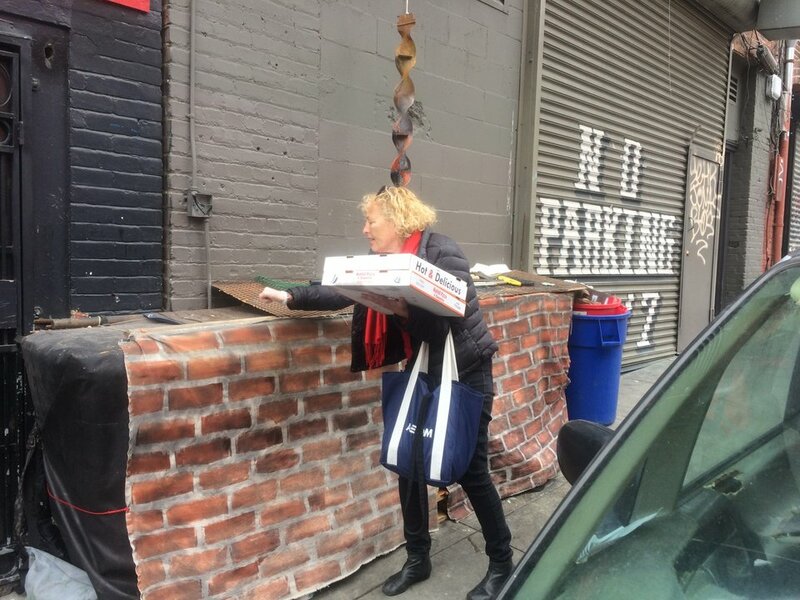 Back on Larkin Street, she asked a man passing by if he'd like some pizza. Startled by the gesture, he politely declined. "Sometimes its hard to tell the difference between hipsters and the homeless," Michaels said, laughing. On a different block, the woman from the pizzeria approached with her husband, who identified himself as Sea Strayhorn, great-nephew of renowned jazz composer Billy Strayhorn. "She gives not to get something back," he said of Michaels. "Non-stop, she comes down here to give. There aren't many people like that on this planet." Strayhorn said he and his wife lost their home due to "skyrocketing rents," but they prefer not to apply for government assistance. "We're willing to rough it," he said, adding that they're both thankful for Michaels' daily pizza runs. Michaels said she plans to continue sharing pizza for as long as she can and finds friends to fill in when she's traveling. "I'm just a neighbor," she said. "This is how I choose to spend my time."